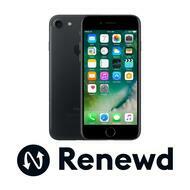 A Renewd iPhone is a reworked iPhone, which are provided with 100% original Apple components. All Renewd iPhones are checked at more than 70 checkpoints by a certified premium service provider and are delivered with a 2 year warranty. They are therefore always safe to maintain the highest quality. Also, give an iPhone a second life. Minimal or no signs of wear. Display has neither scratches, nor micro-scratches!